In my last blog post, I told you I was working hard behind the scenes to improve the mechanics of The Crohn’s Colitis Effect. I’m happy to announce today that I’ve added a new functionality to the website. 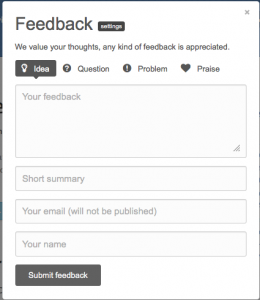 You can now submit your feedback to me! It’s important to me to always feel connected to you! To know what you think of the advocacy I provide… To know how you feel about The IBD Round Table Discussion… To know how we can improve what we do and how we do it… And even know if you have a problem with something. I welcome all of your feedback and hope that this new feature will be something that will continue to help me improve how I can help and support the IBD community! In the middle of the left side of the website, you should now notice a Send Us Feedback button. The button is located on every page of the website, so no matter where you are or what you are viewing, you’ll always have a quick way of letting me know your thoughts. Question – Where you confused by something said on The IBD Round Table? Not sure about some of the information we have on our website? Or do you have an IBD related question you’d like me to answer? Problem – Not happy with something you saw on The IBD Round Table? Is the website not working in a way that you think it should? One of the text boxes under the categories is for you to leave your e-mail address. I want to assure you that I will NEVER sell your e-mail address or give it to anyone! I value you and your feedback immensely and would never do anything to compromise that. This field will help me to reply to you if what you submitted needs a response from me. I really want to express my gratitude and thanks for your support and time! It means so much to me that you take the time out of your busy day and when you’re not feeling well to watch and support what I do here!